I believe that in Bollywood, till date, there have been very few movies that have been so utterly fresh, romantic and innocent, all at the same time. And in list of those movies, Bobby stands first among them equals...exuding a rare freshness that is alive to date. Stories go that immediately after its release, Bobby became a fashion dictat, with dresses, scarves and short skirts carrying 'Bobby' tag to sell more. It was in my early teens that I first got to see this movie...(what timing!) Before that much about Bobby had passed by my ears, and so my general opinion about the movie was a bit mixed...is it bold...are there a lot many kisses or is there a lot of skin show...I used to wonder. But frankly, when I actually got to see the movie, by God! what a revelation it was..! Beautiful actors, beautiful clothes, simple story, beautiful music, scenic landscape...Everything seemed so perfect, that I wondered if I had missed something. Was there some scene that had been censored? A thorough and demanding discussion session with friends followed. And to my amusement, the discussion gave back very naive reasons for the film's portrayal as a bold one. The story was that days following the release of the film, Bobby's, i.e. 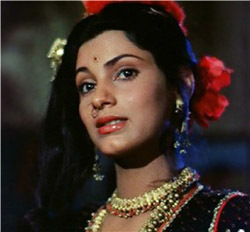 Dimple Kapadia's wardrobe had created a bit of a furor, and hence the hullabaloo about the film being a bit bold. O my God! That's was it...What a let down! Now coming back to the romance part. Wow! How fresh, beautiful and innocent. And how dignified. Industrialist's son Raju formally proposing friendship to Bobby, a fishermonger's daughter and a girl of very humble background. "Mujhse dosti karogi?" And Bobby, with a thousand expressions on her face, smiling back...Can anything get more beautiful than this...I don't think so! Bobby's storyline was simple - as simple as a typical Bollywood formula film can get - Young teenagers Raj, 18 and just back from boarding school, and Bobby, sweet 16 and the daughter of a middleclass fisherman, fall in love. 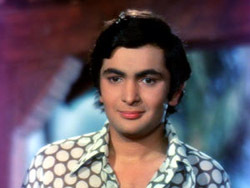 Raj's father Nath (Pran) vehemently opposes the relationship and even unsuccessfully tries to buy off Bobby's father Jack Briganza (Premnath). But as the world knows, love has no boundaries...Hell breaks loose as the lovers run away from the warring fathers.... a little bit of action, some rona-dhona and emotional blackmail...and the fathers reconcile their differences, giving the film a perfect they-lived-happily-ever after ending. And now, not to forget the music part of the film.... the music and the lyrics...gems aplenty. Right from Main shayar to nahin to Narendra Chanchal's Beshak mandir masjid todo, each piece is in sync with the story. Even the item number Uska choota ghar baar sansaar, which had Aroona Irani playing a temptress, justifies itself, what with her light hearted attempts at seducing a visibly naive Rishi Kapoor! Music duo Lakshmikant Pyarelal's range for this ambitious movie was just impeccable...While you have the sweet couple playfully teasing each other inMujhe kuch kehna hai, Hum tum ek kamre main and jhooth bole kauwa kaate, Premnath playfully gyrates to the tunes of Na mangu sona chaandi...Even the sad numbers Ankhiyon ko rehne do and Beshak mandir Masjid todo fit the mood perfectly. Perfection in every department. 'simple and sweet storyline, great direction, melodious music... no doubt that this bounce back vehicle from the studios of showman Raj Kapoor set the film industry rocking!